The Isle of Wight Festival 2018 will take place from June 21 to 24. Here's our guide to lineup rumours and ticket news. Please do leave a post at the bottom of the page if you hear of any rumours for the Isle of Wight Festival 2018. The first Isle of Wight Festival was held in 1968 in Godshill, so this will be the 50th anniversary year. If you want to get your accommodation booked early, take a look at our guide to places to stay near the Isle of Wight Festival site or for cheap accommodation try our guide to Isle of Wight holiday parks - although bear in mind that the dates haven't been confirmed! 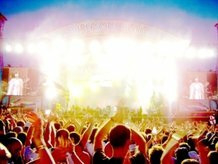 Where can I buy tickets for Isle of Wight Festival 2018? How much are tickets for Isle of Wight Festival 2018? OK, so we predicted two of the headliners – Liam Gallagher and Depeche Mode – although admittedly we had many other names on our rumours list which won’t be playing now. If you’re interested who we thought might play, check out the names in the archive bit at the bottom of the page. What's the cheapest way to get to the Isle of Wight Festival 2018? Red Funnel are doing discounted ferry travel for Isle of Wight Festival 2018. Current offers include £10 foot passenger tickets and reduced price car ferry travel if you book early. ​You can get 10% off car ferry travel with Red Funnel if you use this exclusive booking widget, although you'll probably find the specific festival deals are better. What accommodation is near to the Isle of Wight Festival (apart from camping)? Trivago search "Isle of Wight Music Festival"
When is the Isle of Wight Festival 2018? Isle of Wight Festival 2018 is taking place from June 21-24 2018. In previous years it has mostly been held earlier in the month. I think it has been moved as there is no Glastonbury Festival in 2018, so organisers will be hoping to mop up some people who would normally go there. Can my band play at Isle of Wight Festival 2018? There was also a Platform One stage at Isle of Wight Festival 2017 (Platform One is a college of music on the Isle of Wight). Should I go to the Isle of Wight Festival 2018? The Isle of Wight Festival has evolved (like most festivals) from one great big stage to a 'visitor experience' (John Giddings' words) with various big tops, bars and stages. There are also funfair rides etc. The age range at the Isle of Wight Festival is pretty wide with loads of families (kids get in free in 2018) and lots of people who are old enough to have attended the first festival in 1968. If you grew up on the Isle of Wight there's a high probability of witnessing one of your schoolteachers looking worse for wear after a jug of Pimms. Who would you like to see at the Isle of Wight Festival 2018? The stage splits have been announced for Isle of Wight Festival 2018. We don't have times yet so we don't know exactly how the clashes with the two stages will end up. I seem to remember the main stage finishing earlier than the Big Top last year. A load more supporting acts have been added to the lineup, including Travis and The Wombats. This completes the main stage and big top lineup. So, now we know the headliners for Isle of Wight Festival 2018 and we have ticket prices. Oasis - John Giddings told the Isle of Wight County Press in 2016 that he'd like to book Oasis, Green Day and The Kinks. Liam Gallagher may be more likely than Oasis. Depeche Mode (eFestivals says this is a ‘strong rumour'. 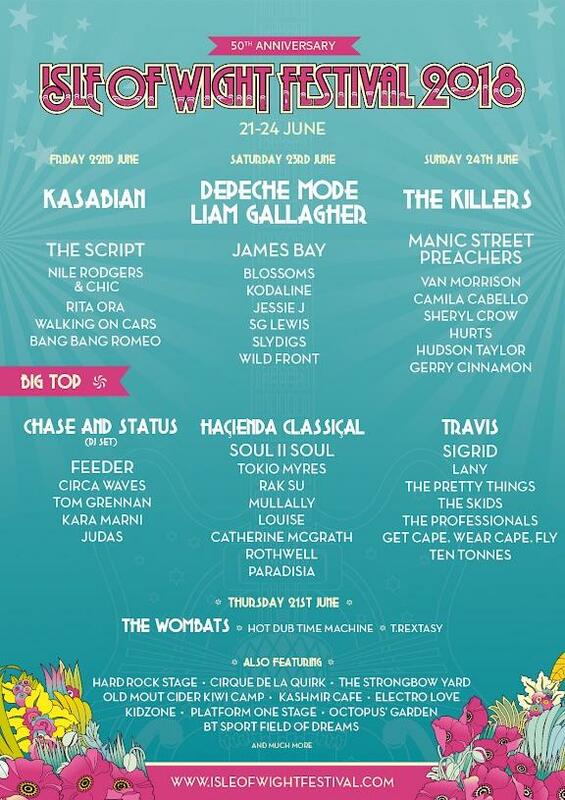 John Giddings has previously said in 2013 that he'd like them to play at the Isle of Wight Festival). This is hardly worth being considered a rumour, but John Giddings has said he'd like to reform Pink Floyd and Led Zeppelin, so maybe one day he'll persuade them to play at the Isle of Wight Festival. The early bird and Islander tickets sold out on November 14th. According to the Isle of Wight County Press, John Giddings 'said he hoped to announce all three headliners on December 4th — but declined to hint who might grace the main stage'. and will cost £135 plus booking fee for early birds. The reduced price will only be available until November 28th 2017.
? #IOW50 early bird tickets are on sale TOMORROW from 8am! ? The dates for the festival have been confirmed for 2017 - it has moved to the 'Glastonbury' weekend (June 21 - 24 2018). Glastonbury isn't on in 2018, so it's a good excuse to pick up some people who might go there instead. Tickets go on sale 'soon'. No idea what that means. I told my wife I would put up a picture 'soon' but it's been sat on the floor next to me since Christmas.